With children breaking up from their school's throughout the week, I've put my thinking hat on, and have been thinking up ways to entertain Spud through the next week or so, before the big day arrives! One of the activities that keep popping up in my head over and over again is Christmas related arts and crafts! With not much money spare, it's cheap for us adults, and extremely fun for both adults and children! 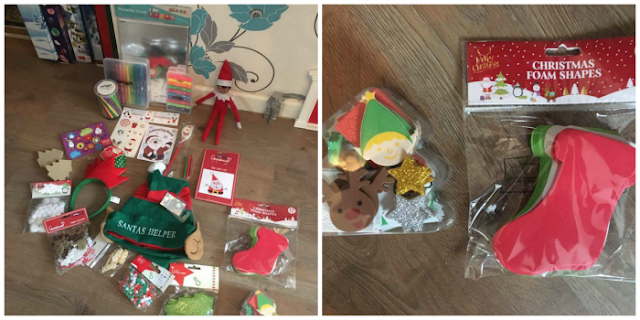 When our elf Buddy left us some Christmas themed cards last weekend, it seemed like the most perfect time to get practising, and so me and Spud delved right in! 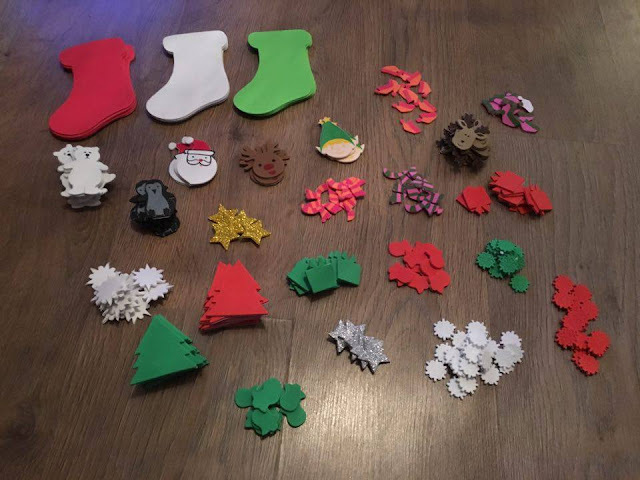 We was left a whole heap of products, including lots of Christmas themed foam products including stockings, Christmas trees, reindeer's, snowflakes and elves of course! Inspired by the 12 Days of Christmas, I sat and watched Spud make a festive design himself, whilst I planned thoughts in my head of what we could make next! 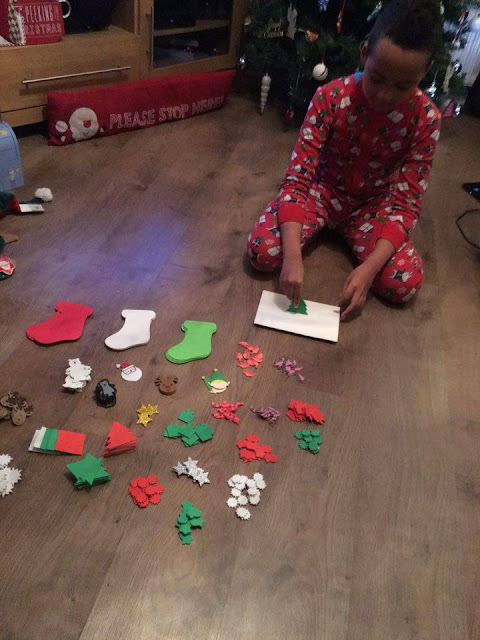 I watched as Spud changed his mind many times, which made me change my mind too, I want the perfect activity session to occupy my boy during the festive holiday, before he gets all his new bits and doesn't want to spend a second longer with mummy doing arts and crafts! 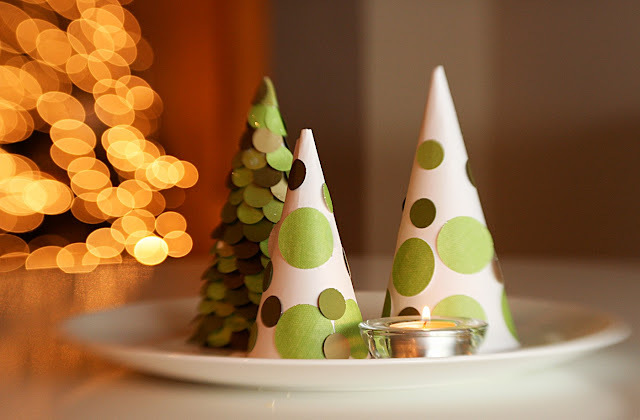 A glue gun we don't own, however, we do have card, and lot's, I mean lot's of it, we also have a circle hole punch stashed away upstairs in the arts and crafts box, so the next thing on my list is to try these Christmas Cones as found on the campaign that I linked to in the paragraph above! 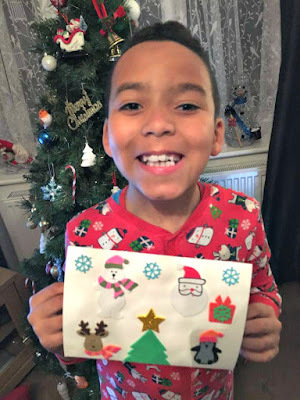 Until Spud breaks up from school, we can't do anything too fancy, so we stuck with making Christmas cards for now, however, we, or at least I, have lots of idea's for next week, when the days fly by for us adults, but yet they drag by for children all over the globe. 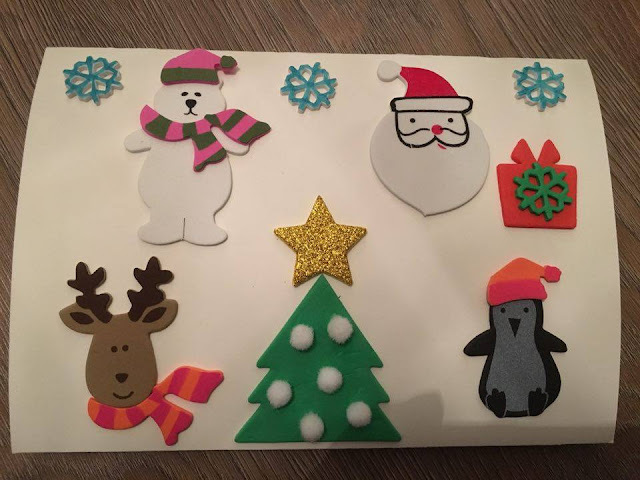 This is Spud's Christmas card above, it features a polar bear, a penguin, a reindeer, Santa himself, a christmas tree complete with baubles, a star on top, a present next to Santa, and snowflakes from the sky! I was quite impressed with Spud, he wanted blue snowflakes, but as we only had white ones, instead of changing his mind and deciding not to use them, he decided to colour the snowflakes we had, making them blue himself! This is just one of a few arts and crafts session I have booked in with Spud, you can find many more on the Euroffice page mentioned earlier on in this post! I'm not going to leave things here though am I? In good old festive spirit, I have a goody bag for one of my very lucky readers/visitors to win! For your chance to win a selection of products, I'll leave it as a surprise, but can tell you it contains stationary, just enter the competition via the Rafflecopter below!